The choice of home brew kits are immense. You can brew practically any type of beer or lager, which can be ready to drink in just over two weeks. If you want to learn how to brew beer then you've come to the right place. Home brewing can be a complicated process, can be, but doesn't have to be. If you can follow basic instructions then you will be able to successfully brew your own beer. If you are a complete beginner to home brewing then the easiest way to get started is to buy a home brewing kit. Everything you need is included in the kit, no measuring to do, just add water. Now that couldn't be simpler! The choice of home brew kits are immense. You can brew practically any type of beer or lager, which can be ready to drink in just over two weeks. One important piece of advice is to make sure everything you use is clean and sanitized. Skipping this procedure is the sure fire way to fail and create nothing other than a foul smelling, strange tasting liquid that is undrinkable. If after you've successfully brewed using a kit you may feel more adventurous and want to try making your own beer from scratch. The basic ingredients for making your own beer are hops. Yeast, water and barley. This method is obviously more complicated than using a pre-prepared kit and if you are doing any research on brewing beer you will come across terms such as half mash and full mash brewing. This is the next step on from buying a kit. You basically find a recipe you'd like to follow then buy the ingredients separately. Unlike the kits where everything is provided half mash enables the brewer to tweak the ingredients, in other words fine tune your brew to suit your exact taste. This is strictly for the experienced brewer and should not be attempted by a novice!! This method really is starting from the very beginning, including selecting grains to extract the malt from. The end result however should be a completely unique tasting beer. - this will hold the brew during the fermenting process. (The recommended minimum capacity is 5 gallons). - Look for a food grade plastic bucket, again with a capacity of 5 gallons. This will come in useful when starting the syphoning process. - It is crucial to the brewing process to ensure that everything is kept clean. This prevents a build up of bacteria which will completely ruin the whole of your brew. Sterilisers can be found in either powder or liquid form. - To stir our brew with. - This is basically a filter lid attached to some plastic tubing which allows pressure to be released from the brew, at the same time preventing anything from getting into the brew. - To store the brew in. Glass bottles with screw tops are the best as they stand up to the high pressure from the fermentation process. If you have decided to take the next step from using a ready prepared kit then these are the ingredients you will need to prepare your brew. - Most commonly made from barley. The ideal variety for a newcomer to brewing comes in a can which is particularly useful for the less experienced brewer. - Everyday granulated or castor sugar is not the right type for using with home brew and will affect the taste of the end result. The recipe you choose to follow will advise you on the type of sugar required. Most brewing sugars can be bought from a brewing shop for a similar cost to everyday sugar. - This is the one ingredient that you shouldn't skimp on. Always ensure that you use a brewers ale yeast for your brew. 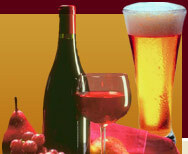 - In brewing terminology water is referred to as liquor. The area in which you live will determine the smoothness of the beer you produce. Ensure all equipment is thoroughly sterilised. Rinse out the brew bin. (You may think the bin doesn't need rinsing out but do not be tempted to skip this step. This plays a huge role in ensuring fermentation takes place). Stir in 1kg of sugar until dissolved. Add the malt and stir until dissolved. Stir thoroughly then add the yeast. The fermentation process now begins. Over the coming days froth will appear that needs to be removed (At first a pipe can be used to transfer the froth into a bucket of water) When this starts to subside the syphoning kit can replace the pipe. At this stage is is important to ensure that the bin lid is not on too tight. This is extremely important as the build up of pressure can lead to an explosion. During the coming days stir the brew now and again. Now leave the brew alone for 2 weeks. (Although you may be tempted to check it, please resist as this is a crucial stage of brewing). The fermentation process is complete when there are no bubbles rising to the top. Syphon your beer into sterilised bottles and leave for at least two more weeks.